"Got ‘em. The tracks are fantastic. The fiddle knocked my socks off. Looking for one two more fiddles and steel…"- Case Garett. 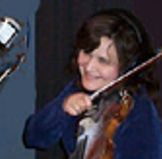 If you're going to spend money on fiddle tracks or violin tracks online, be sure you get the BEST! We have the best! You'll get a violin or fiddle track played by one of two equally awesome fiddle players: either Wanda or Jenee (see the "Talent" page of this site for partial credits). There's a difference between an excellent live player and a session quality player, we hire only the latter. She recently played on two #1 Billboard country hits "Head Over Boots" and Dirt On My Boots" by Jon Pardi and has been the fiddle player for all country contestents on "The Voice" (NBC). Jenee also plays viola and cello. If you have a keyboard-generated string track, (or have us provide one) on a song that could benefit from some real strings, she can add a combination of viola, cello and violin, just like she did on Rascal Flatts last record. With the live work placed out front in your mix and the keyboard strings back some, it will add the live spark as well as depth to give you a truly incredible sounding recording! Ask about pricing for this. In fact, here's a sample of that! Fiddle Tracks Online repeat client, Donovan Farrell had this done. Excited by the keyboard track alone, his one-word e-mail comment when he received the live violin files was: "AMAZING!!!!!" The sample clips are of our fiddle players playing on client recordings, as intros, playing a solo with fiddle or guitar following, sometimes fitting the fiddle part into modern country music and holding their own in the denser mix. "Santa Fe" "Lover Let Me Go" "Cowboy Jukebox" and "Short Girls" are © 2014 by the publishers and songwriters, used by permission. All rights reserved. Unauthorized use is a violation of U.S. and international copyright law. All sample tracks and Tracks Online projects are produced by Bill Watson © 2014 Nashville Trax. Why order your online fiddle track from us? Because we use only proven full time Nashville session quality musicians playing a top quality fiddle into professional grade microphones, through an Avalon 737SP and Avalon U5 pre-amps and onto Pro Tools HD commercial grade recording medium, recorded by a qualified tracking engineer at a Nashville Recording Studio. Fiddle can be one of the scratchiest, pitchiest, unstable instruments to wrestle with in a mix. 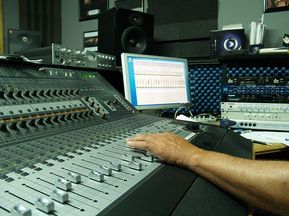 Without a great session quality player providing it, playing it into professional microphones and pre-amps you may waste a lot of mix time trying to make a fiddle part work and end up ditching the track completely. There are a lot of great live-band-situation fiddle players but the overwhelming majority can't play at session quality or even close. there are only a handful of world class session players. "Super fiddle track, man! Clean, tight, just off the chain! Thanks so much! "- Music Producer T.J. Wilson, Los Angeles, CA. It's so EZ to add a fiddle track, played by a Nashville professional session quality player, to your home or studio recording project. Step 1: Make an mp3 stereo mix of your project. Four beats of click track or your drummer saying "1-2-3-4" upfront is helpful but not necessary. A vocal helps a lot, but best to keep it low in the mix, just enough to be audible so the player hears where the vocal phrases are to fill around but can still concentrate on locking into your music track. Step 2: e-mail the MP3 mix to nashtrax@bellsouth.net add any notes for the engineer, producer or player you feel are needed. Step 3. Pay. The best and fastest option is to pay via Pay Pal to nashtrax@bellsouth.net. You can also pay with the appropriate Pay Button abovet. For $125 you'll receive one part with pads where there are vocals or other instruments filling. Unless instructed otherwise, you'll get fills in any holes throughout the song as well as a solo if there's a section left open for solo fiddle. Two songs, both needing fiddle? Get both for $235. Three songs or more? Just $110 each!